The volunteers were in high spirits this afternoon when they managed to get the 8 cylinder Brotherhood engine running for the first time in over 20 years, (we don't know exactly how long ago but we know it is certainly at least 20). It still has no exhaust manifold on it so the experimental first running was very noisy - and smoky!! - but this did not dampen enthusiasm. The restoration work is a credit to the skill and many hours of work carried out by the team. The fact we had just lost the daylight does make the photographs very dramatic. The 500bhp engine was removed from Kirkstall Brewery in Leeds in 1994. The engine is a type R63/8 and was built in 1943. Below are some photographs of it's first start and do check out our YouTube videos as one of its first running will be added soon. More photographs can be found in our Gallery section. After many months of painstaking restoration work the Brotherhood engine turned over at our closing weekend, using compressed air. It is a tribute to the hard work and skill of our volunteers and the many companies who have helped us. 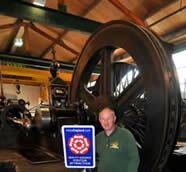 For videos of the restoration work see You Tube We hope the engine will be running under its own power next season. A local trust has given the museum financial help towards the piece of music we have commissioned to celebrate the 150th anniversary of the internal combustion engine, which is this year. The anniversary has great significance not only for the museum but also for the north west of England, as the birthplace of the Industrial Revolution. The working title for the piece of music is THE ANSON. The music will reflect and be inspired by the sights and sounds of the engines at the Anson Engine Museum and we are very excited by the combination of art, history and engineering that the project represents! We hope that THE ANSON will have its premiere performance at a celebratory event at the beginning of next season at the museum. - Jonathan Taylor, a young composer from the Royal Northern College of Music, who was recommended to us by Clark Rundell, Head of Conducting and Director of New Music at the college. Jonathan has particular experience of composing exciting and very accessible music for brass bands and his reputation in the brass band world is growing rapidly. - Vernon Building Society Poynton Brass Band, a superb championship band, with obvious local connections to the museum. In the photograph on the right is Alice Herbert (Chairman of the Trustees for the Mabel Evans Trust) handing over the cheque to Geoff Challinor. With the addition of some roof sheets to the lean-to on the main building of the museum, we hope to have more engines unsheeted and running for the closing weekend 30/31 October. Engines in this area include a 2 stroke Vickers Petter CR2; Blackstone engines (EH, P, diesel injection, hot bulb oil, lamp start paraffin); an 8 cylinder Brotherhood type R6318; UL8 Mirrlees and Lister CS compressor. The museum received an anonymous shopper last weekend who at the end of their visit announced they had been carrying out the annual inspection as part of VAQAS accreditation. VAQAS is the Visitor Attraction Quality Assurance Scheme. It is VisitEngland’s quality assessment service for all types of visitor attractions throughout England. All areas that impact on the quality of the visitor experience are included in the assessment, ranging from the initial enquiry through to the departure. The inspector was delighted with the facilities and the warm welcome given to visitors and said that many of the larger attractions in the area could learn a lot from a visit to this museum. 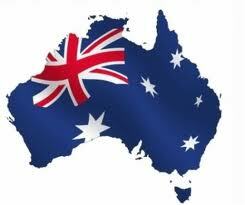 The museum was delighted to host a visit of 33 visitors from down under as part of their Heritage tour of the UK. It was the 11th Vintage Machinery Collectors and Restorers Tour which covers destinations in England, Scotland and Wales. Their plan is to visit a variety of the UK's famous attractions, in addition to historic and vintage machinery associated highlights (see below). The visitors arrived keen and eager and were delighted with what they found, particularly as so many engines were actually run for their enjoyment. All too soon their time ran out and reluctantly they boarded the bus to go off to their next destination. Unfortunately many of our photographs of the group visit did not turn out, so we invite anyone who came to the museum with the group to add their photos on our facebook page “Anson Engine Museum” or send to enquiry@enginemuseum.org Here are a few that we managed to retrieve. Portsmouth Historic Dockyard; Isle of Wight Steam Railway Museum; Clifton Suspension Bridge; The Big Pit, Blaenavon; Severn Valley Steam Railway; Ironbridge Gorge Museum; Manchester Museum of Science & Industry; Anson Engine Museum; Clydebuilt Maritime Museum; Darlington Railway Centre & Museum; National Railway Museum; Great Dorset Steam Fair Click here for more details of next years tour of the UK. We hope you enjoy the rest of your tour and look forward to welcoming you back again in the future. David Rutley the recently elected MP for Macclesfield enjoyed a midweek visit to the museum along with his 4 children. They were fascinated with the displays and the running engines and expressed surprise that the museum was so large with so much to see. He wrote in the visitors book that he was very impressed and in a newpaper interview urged more people to visit this fantastic attraction. The photo on the right was taken by David's son. Using the donate button on the home page of our website a well wisher gave a massive £2000 donation to the museum. We cannot express our thanks direct as they have done this anonymously, but we want to pass on our heartfelt thanks. This wonderful boost to our funds will help us with some projects we have planned so we will be able to put them into action sooner than we had dared hope. Many, many thanks. We are delighted to report that we managed to complete the removal of the engine before the demolition squad arrived on site. It is now in storage awaiting final tranportation and restoration at the museum. If you would like to follow the progress of the engine's removal see the photographs on Facebook. Although the work was spread over several weeks they were not full weeks so lots of stopping and starting that may not come over in the photos. Our thanks to everyone who helped us with this engine rescue. June was a very busy month for the museum, especially the last few days. Click on the link to read all about it, including report on 1000 Engine Rally. At a glittering award dinner at Chester Racecourse the museum heard the news that they had received "Highly Commended" in this years awards. The judges particularly praised the exceptional customer care the volunteers gave to visitors. 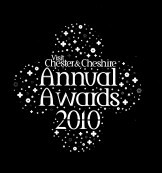 The museum had been shortlisted alongside The Salt Museum, Go Ape and Chester Heritage Tours. Our congratulations go to Chester Heritage Tours who won the category and will go forward to the North West Regional Final. The museum can provide a dating record service for Crossley, Tangye, Mirrlees and Gardner engines; even then we cannot guarantee that we have all the records but will provide what information we can from those available. To help us help you, please download and complete the attached form. We currently can only handle queries via postal mail service not email requests. We now have tickets on sale in our on-line shop for the coach to the museum on the Saturday 26th June, the night of the 1000 Engine Rally. Click here to order. 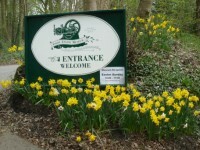 The coach ticket includes return trip from Astle Park and entrance to the museum. Additionally it also allows 50% off entry for a return visit to the museum in 2010. The Museum is developing the celebration exhibition of 150 years of the Internal Combustion Engine. Those of you that have been before will see signifigant changes made over the winter period to enhance the appearance of the Museum and the exhibits. View the latest photographs of the work by clicking here. If you would like to donate towards the removal and restoration costs of this 75 ton giant you can do so by clicking here. Thank you. It is now only a matter of days until Geoff Challinor, our Curator, goes to Buckingham Palace to be presented with an MBE for Services to Industrial Heritage. One of the life members of the Museum's "Friends" came to the museum today to tell Geoff all about his recent investiture so he now knows what to expect. Tony Green MBE explained he received his medal from Prince Charles who was very knowledgeable about Tony and his place of work. "It was an amazing experience" said Tony, "everyone went out of their way to put you at ease and seeing all the Cavalry officers and Beefeaters in their full regalia was wonderful." Geoff will be at the Palace on the 2nd June (same day as Jenson Button we understand) to receive his medal. We will post photos of his investiture soon. 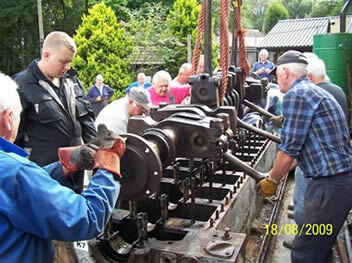 There are photographs of the engine being dismantled on our Facebook page. Click here to view. This video shows the last run under load of a Crossley Premier 8 cylinder Vis a Vis engine on The 15 April 2010. In 1934 3 Crossley Premier 8 cylinder Vis a Vis engines driving Gwynnes Invincible water pumps where installed for land drainage, at this time it was the world’s largest pump drainage station. In 1951 a 4th engine was installed, the other 3 engines have been replaced with electric motors and a modern Allen diesel engine. The Crossley engine is rated at 1500hp at 215 RPM coupled to a David Brown gearbox reduced down to 93 RPM; the water pumps can displace 1057 Tons of water per minute with a static head of 9 feet. 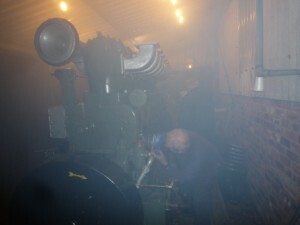 The intention is to remove the engine and gearbox for installation at the 'Anson Engine Museum' in a running condition. If you want to help us save the engine and move it to Cheshire donations can be given via our website home page or,if you want to offer your time and expertise please contact enquiry@enginemuseum.org and our Curator will respond to you. On Tuesday 11th May another 40 members of the local IMechE clubs will visit the museum for a tour and demonstration. In November last year a similar event sold out the 40 tickets so another event was set for this week and once again has proved to be very popular with members. After light refreshments the group will be given a short talk about the background and history of the museum then taken round for a personalised tour with many of the iconic engines being run. For photos of the visit click here. Visit England are running an unusual competition asking you to send in a one minute video of you enjoying your "favourite minute in England" and you could win a terrific prize. Click here for more details. It would be great if your minute was one at the museum but feel free to enter whatever you would like. Just in time for the start of the season, we have taken delivery of a lovely 5 hp Hornsby oil engine and compressor from Trinity House. Originally installed in 1912 at Serk Lighthouse, Channel Islands and used to maintain the Reed type fog signal until the station was modernised in 1969. Larger images can be seen in our Gallery area. 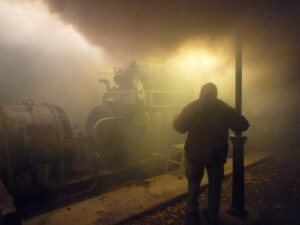 Over the 2010 season we hope to have this engine "in steam" but for now have managed to get it turning over on electric. See video here to see how magnificent it looks. After an exhaustive building programme over the winter months the museum volunteers are on a countdown to get all areas ready for the re-opening for the season on Easter Sunday and Monday. Work has included moving walls, adding new exhibition display areas, building a brand new reception/shop and tearoom and giving everywhere a lick of paint. The new cafe has benefitted from a donation of tiles and grouting from local tile company A6 Tile Solutions and the whole new entrance area sports a lovely finish thanks to Resin Surfaces Ltd.
Over in the Memorial Building the whole place is receiving a new layout as we prepare for our big exhibition for 2010 celebrating the development of the Internal Combustion through the ages. Thanks to all the hard work of the volunteers a few years ago the several tons of daffodil bulbs up the driveway should make a bright welcome for the start of the season. Museum open 10:00 - 17:00 Easter Sunday and Monday, then every weekend throughout the season. A new Twitter campaign is aiming to galvanise the growing number of museums on the site by encouraging online jabberers to talk up their favourite venues. Follow a Museum Day, on Monday (February 1), is urging users of the social networking site to tell the world about the museums they monitor. More than a million posters are estimated to have linked with museums on the site, and planners reckon their campaign could spark greater discussion between organisers and audiences, as well as inspiring increased visitor numbers. The Twitter museum directory currently spans 34 countries, from Bahrain's Al Riwaq Artspace (sadly not updated since the start of December, at the time of writing) to more than a dozen Mexican museums and better known counterparts such as Pittsburgh's prolific Warhol Museum and France’s Pompidou Centre. Participants should end their Tweets with the hashtag #followamuseum on Monday. Visit the campaign homepage for more details.